After President Trump reposts picture of Likud billboard featuring himself and Netanyahu, White House clarifies president remains neutral. 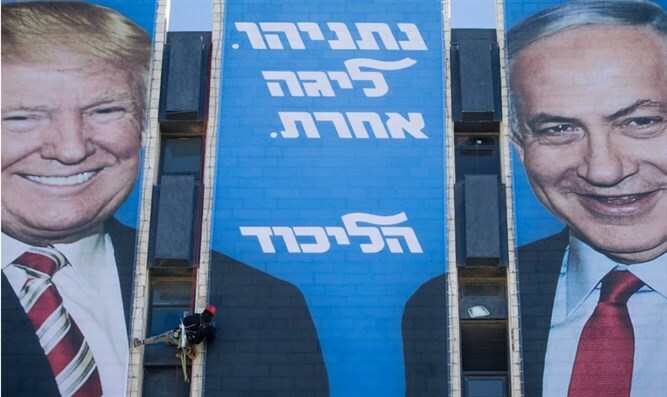 President Donald Trump may have shared an Instagram photo showing an Israeli billboard of himself with Prime Minister Binyamin Netanyahu, but he’s not endorsing any candidate in Israel’s national elections, the White House told the Israeli media. Late Monday night, Trump shared a photo of a several-stories-high campaign billboard that shows Trump and Netanyahu smiling and shaking hands. The billboards were unveiled in two heavily trafficked areas of Israel on Sunday in Tel Aviv and Jerusalem. Smaller billboards were then placed in locations throughout the cities. The signs read “Netanyahu. In Another League” on top and “The Likud” at the bottom. Israelis go to the polls for national elections on April 9. Likud is holding its primary on Tuesday and Netanyahu is expected to emerge as the winner.